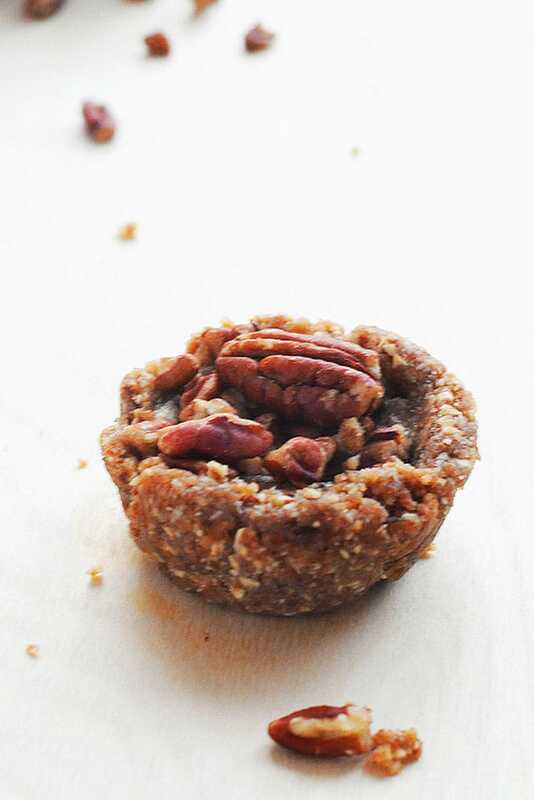 Mini Vegan Pecan Pie recipe are so easy to make and no baking involved. 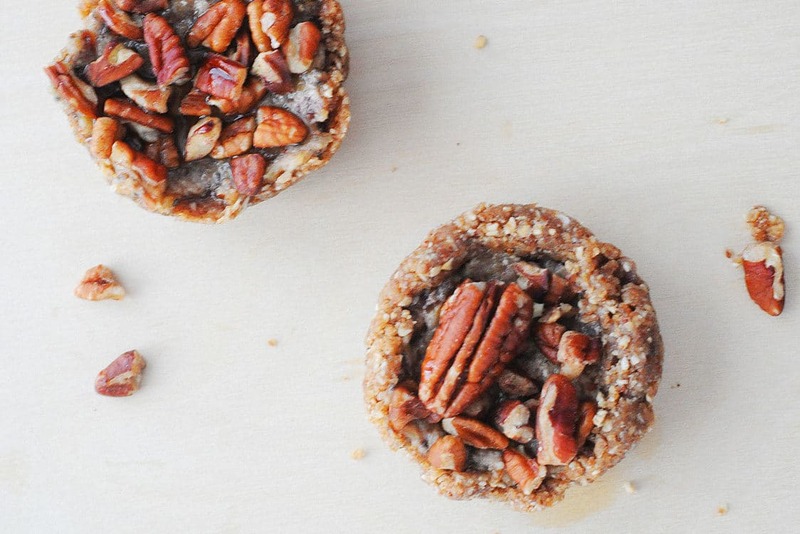 You’ll be surprised on how much this taste like pecan pie. Gluten-free and Vegan for a tasty dessert. 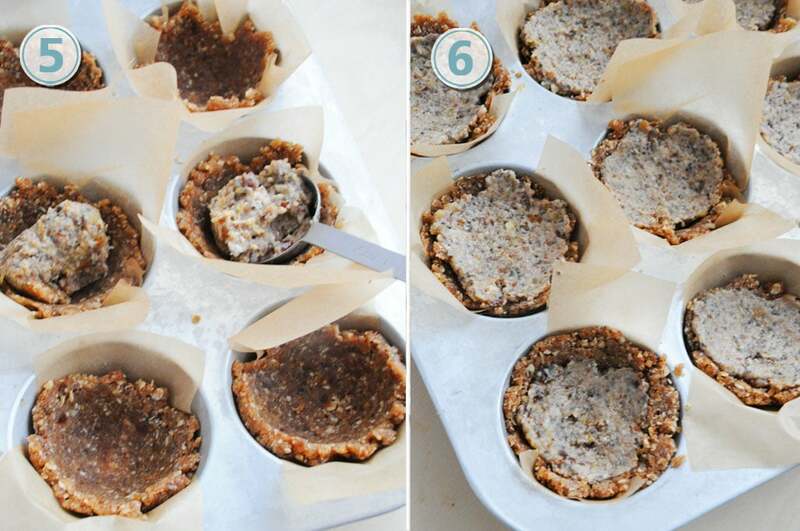 I used my 12 size muffin pan for individuals pecan pies but this recipe will only make 9 Mini Vegan Pecan Pie. 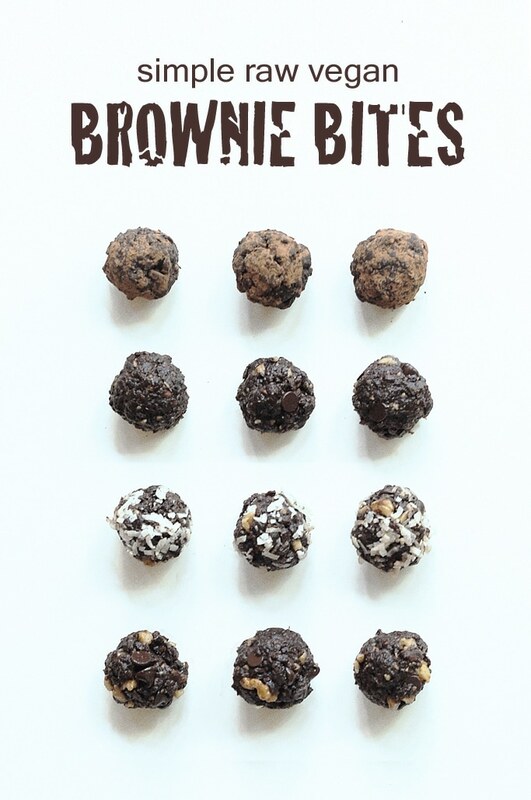 They are the perfect size with no sugar, gluten-free and vegan for your guests. 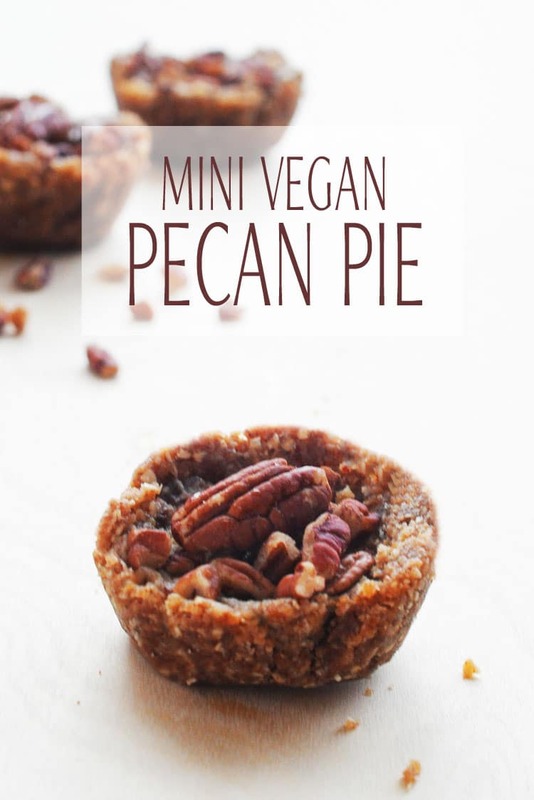 With more and more people limiting their animal intake to save our planet, these Mini Vegan Pecan Pie are perfect for the holiday season. First thing you’ll need is a food processor. I have found that when cooking vegan, it is the one tool that comes in handy to infuse flavors together. The other tool is the refrigerator because you won’t need to preheat oven or bake in the oven. The ingredients are store bought at any grocery store. 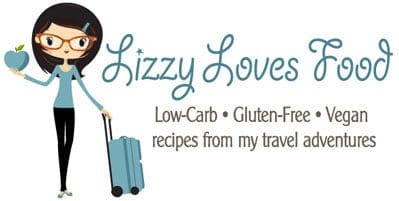 No corn syrup is needed to make this plant based recipes or pie crust to be rolled out. 1. Place ¾ cups of pecans, 9 dates, cacao, coconut butter, oatmeal and a 1 tablespoon of maple syrup in the food processor until finely chopped. 2. 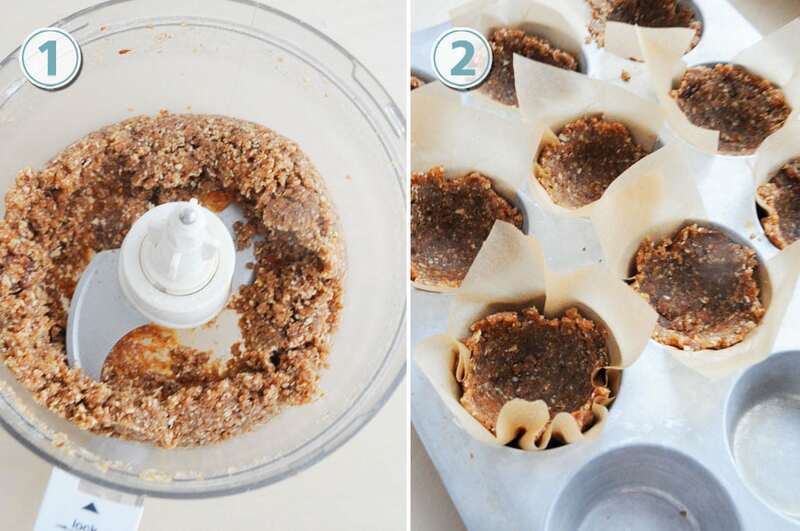 The best thing to do, line a 9 muffin tins with 2 strips of non-stick baking paper. This will make it easy to remove them from the muffin pan. 3. Divide the mixture evenly in to each hole of the muffin pan and using the bake of the spoon to press firmly into the base and sides. Once this is done you can refrigerate for 15 minutes, until the crust is firm. 4. To make the egg chia, place the chia seeds and 1 cup of water in a small bowl and set for about 10 minutes. Mix it around before you pour it into the food processor. 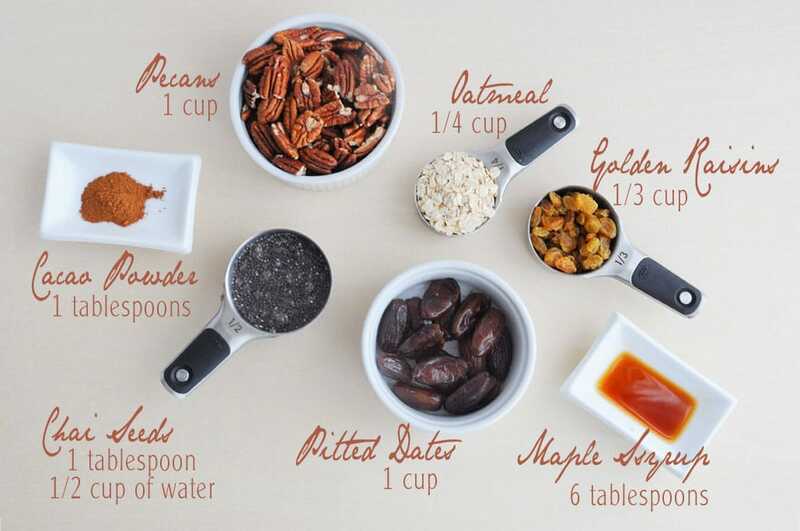 Place the raisins 6 dates, 2 tablespoon of maple syrup and 1 teaspoon of vanilla and pour the chia egg into the mix. I pulse it until smooth it has that creamy texture to fill each cup. 5. Spoon the filling into each muffin and smooth it evenly with the back of the spoon. I like to spoon the same amount in each first before I smooth the top. This makes it easier to have them all at the same level. 6. Once that is done, I will top it off with chopped pecans on top and refrigerate for 30 minutes or until set. I bring mine out right before I am about to serve and let them rest for 5 minutes. 7. Before you serve drizzle some maple syrup on top and your ready to serve. I have tried this recipe with walnuts which was just as good if you love walnuts. Coconut sugar can be added if you like a little more sweetness. Serve with coconut whip cream and some almond vanilla ice cream for a traditional holiday dessert. I love to serve them on individual Christmas plates after our meal. Before removing the mini Vegan Pecan Pie I make sure they are firm by lifting one before removing. I sometime warm up the maple syrup before I pour on top. 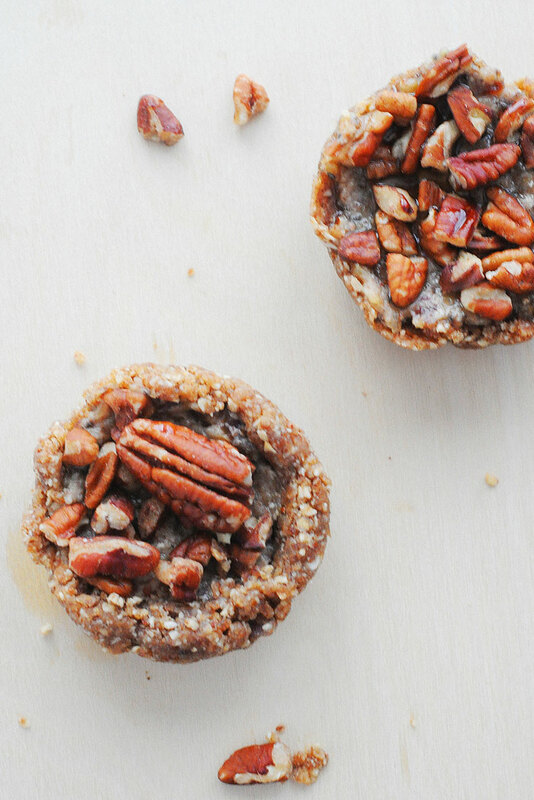 When it’s the holiday season I like to splurge a little but these Mini Vegan Pecan Pie are such a treat. I don’t miss traditional pecan pie and it is a dessert that I enjoy for the holidays. EnJoy! 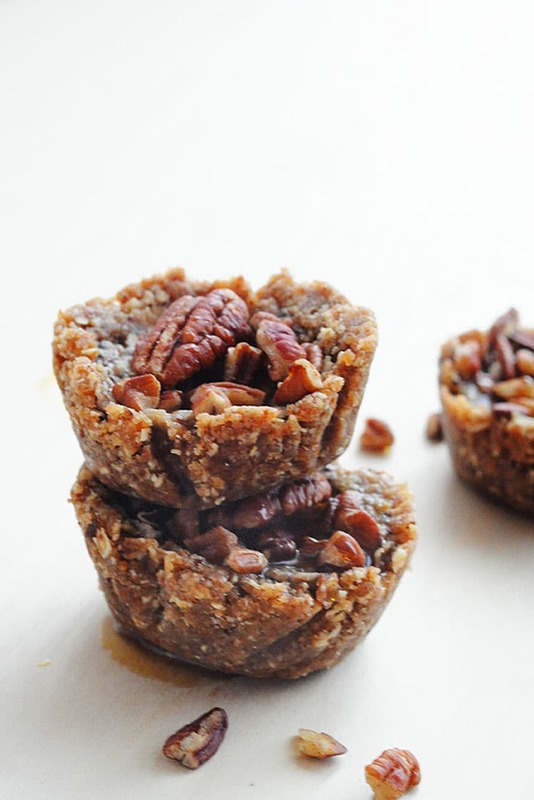 Mini Vegan Pecan Pie recipe are so easy to make and no baking involved. You'll be surprised on how much this taste like pecan pie. Gluten-free, Vegan for a tasty dessert. Place ¾ cups of pecans, 9 dates, cacao, coconut butter, oatmeal and a 1 tablespoon of maple syrup in the food processor until finely chopped. 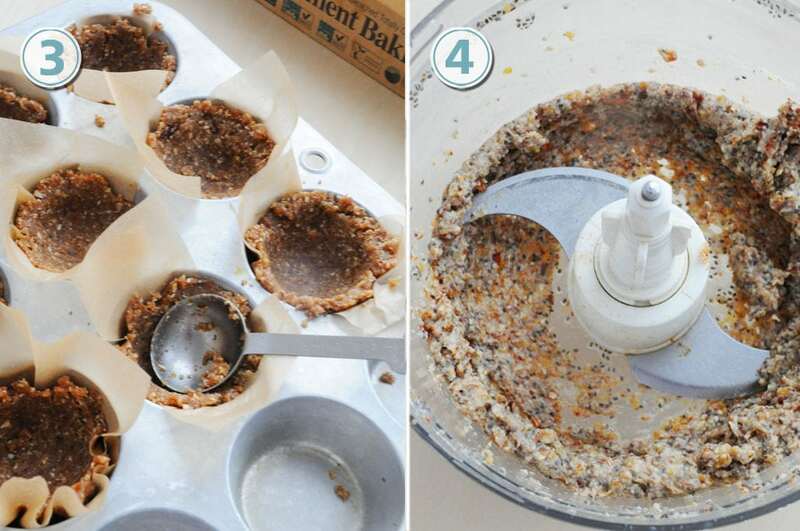 The best thing to do, line a 9 muffin tins with 2 strips of non-stick baking paper. This will make it easy to remove them from the muffin pan. Divide the mixture evenly in to each hole of the muffin pan and using the bake of the spoon press firmly into the base and sides. Once this is done you can refrigerate for 15 minutes, until the are firm. Divide the mixture evenly in to each hole of the muffin pan and using the bake of the spoon press firmly into the base and sides. Once this is done you can refrigerate for 15 minutes, until they are firm. To make the egg chia, place the chia seeds and 1 cup of water in a small bowl and set for about 10 minutes. Mix it around before you pour it into the food processor. 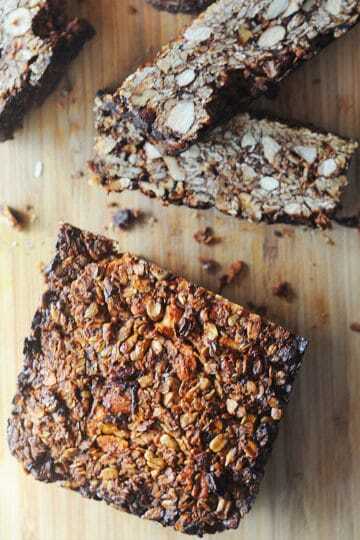 Place the raisins 6 dates, 2 tablespoon of maple syrup and 1 teaspoon of vanilla and pour the chia egg into the mix. I pulse it until smooth it has that creamy texture to fill each cup. Spoon the filling into each muffin and smooth it evenly with the back of the spoon. I like to spoon it in each to make them all even. This makes it easier to have them all at the same level. Once that is done, I will top it off with chopped pecans on top and refrigerate for 30 minutes or until set. I top mine out right before I was about to serve and let them rest for 5 minutes. Before you serve drizzle some maple syrup on top and your ready to serve.